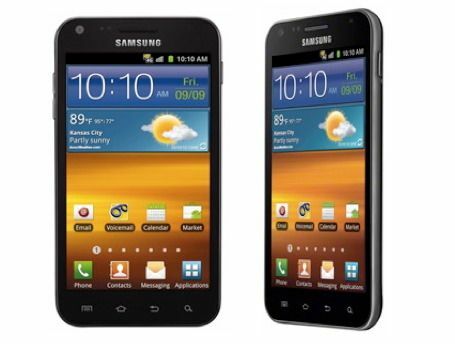 The Samsung Epic 4G Touch is an almost equivalent version of the Samsung Galaxy S2 that we rated so highly. With a slightly more appealing (brighter and clearer) AMOLED screen than the Samsung Galaxy S2, a similar processor, a gaggle of extra apps and a few added perks, the Samsung Epic 4G Touch is a decidedly powerful phone that matches the quality of the Apple iPhone 4S. The Samsung Epic 4G Touch is essentially the same phone as the Samsung Galaxy S2, but there are some noteworthy differences. Both phones use the speedy 1.2GHz Exynos processor, which is designed to improve graphics speed for games, videos, photos and other apps. The Samsung Epic 4G Touch is the best phone on offer from carrier Sprint, and has the distinct advantage of coming at a lower price of just $199 when you sign a two-year contract. At 9.59mm thin and weighing just 128.9g, the Samsung Epic 4G Touch is a remarkably svelte smartphone that fits comfortably in your hand and is light to carry all day. The 800 x 480 pixel screen uses an enhanced screen tech called AMOLED Plus for a finer pixel density. At 4.5 inches, the Samsung Epic 4G Touch screen is a hair longer than the Samsung Galaxy S2, even though the phone's dimensions of 129.7 x 69.5mm are roughly the same. Like the Motorola Atrix 2, the Samsung Epic 4G Touch has a soft keyboard that's highly responsive to finger presses and provides a slight buzzing sensation (called haptics) when you press keys. The Epic 4G Touch has a slightly raised back cover at the base. The 4G service on the Samsung Epic 4G Touch isn't quite what you'd expect in an age of 12MB connections. In reality, this 4G, which uses the Sprint Wi-Max network in the US, clocks in at more like 3Mbps. That's still mighty fast, usurping the speed of many broadband connections. However, Wi-Max isn't the same as LTE in terms of raw bandwidth and low latency for streaming videos and downloading content. The Samsung Epic 4G Touch runs Android 2.3.4 Gingerbread, an operating system that gives better power management, an easier to use soft keyboard and more stability. The front-facing camera has 2MP and the rear camera is a high-resolution 8MP for 1080p videos and super-clear photos. At a subsidised price of $199, the Samsung Epic 4G Touch is hard to ignore. The Samsung Galaxy S2 costs around $600 or more for the unlocked version in the US, and it is readily available. Like the Samsung Galaxy S2, the Samsung Epic 4G Touch is sparse in terms of hardware buttons. Some might object to the lack of a dedicated camera button, but that's a small ding since you can easily put the camera app icon on a home screen. The micro USB port is below the main screen. There's a microSD card slot, but you have to remove the back cover to access it. Fortunately, once you insert an SD card (up to 32GB) you may not need to bother again. The back cover snaps off easily without any effort.